Pakistan's President Asif Ali Zardari pictured on a recent visit to the United Kingdom on Saturday. Zardari supporters fume over "bias"
(CNN) -- Two TV stations in southern Pakistan have been blacked out after news reports that they aired angered supporters of the Pakistani president. The Geo TV and ARY stations have been shut down in parts of Sindh province, including the city of Karachi. 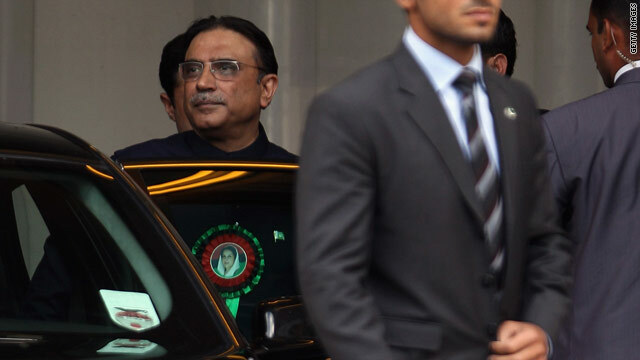 Azhar Abbas, Geo's managing director, said its signals were blocked at midnight Saturday after the station broadcast news reports that a pair of shoes had allegedly been hurled at President Asif Ali Zardari during his visit to Birmingham, England. Zardari has been the focus of criticism recently because of his visit to Great Britain while his country suffered from deadly floods. "Activists of the ruling Pakistan People's Party are threatening cable operators to take Geo off the air as well as cut cables of operators in Karachi and interior Sindh," Abbas said on Tuesday. He said copies of Daily Jang, a widely circulated Urdu newspaper owned by the same group that owns Geo, were set on fire. Abbas said a group of PPP activists surrounded the Geo building on Tuesday, while law enforcement groups did nothing to stop them. Hamid Ullah Qazi, president of Pakistan's cable association, told CNN that PPP activists are threatening cable operators to take Geo TV's signal off the air. Qazi says the threats have been physical as well as verbal through phone calls. Some cable operators had to take Geo TV off the air because of some of these threats, Qazi said. Mohsin Raza, director of news at ARY, also confirmed its signal was blocked the same day after broadcasting the alleged shoe throwing incident. Taj Haider, the PPP's general secretary in Sindh province, was asked whether demonstrators were protesting against the shoe-throwing story. "We were protesting against the bias and baseless news aired on Geo, including this," he said. But he denied threats by PPP activists. "Geo has become a political party, and if they have footage of this alleged shoe-throwing incident, they should show it to prove their claim," Haider said. He said it is unfair and unjust to compare Zardari with former President George Bush -- a reference to the 2008 incident in which a journalist threw shoes at the former president as he attended a news conference in Iraq. He said Geo should come forward with any complaints it has and the government will look into it.